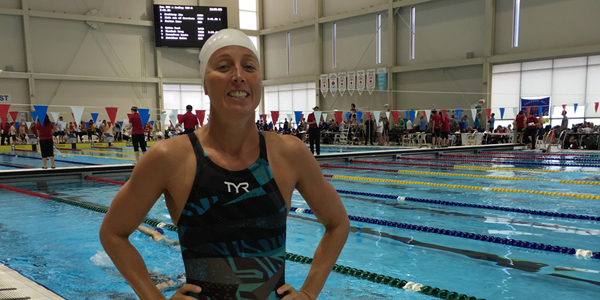 Bermuda’s Lisa Blackburn made a very impressive showing at the Ontario Masters Swimming Championships in Canada this weekend, breaking the Masters World Record in the 100 freestyle. Racing at the Ontario Masters Swimming Championships in Toronto, Ontario, she shattered the Masters World Record in the 100 freestyle with a time of 58.24. Ms Blackburn also broke two American US Masters Records, and came very close to breaking the Masters World Record in the 100 breaststroke, with her time of 1:12.93 extremely close to the record time of 1:12.64. The accomplished swimmer, who has won numerous medals while representing Bermuda at international swim meets, said she is looking forward to being home in Bermuda from April 7-16. “I am in the final stages of planning a couple of swim clinics for Saturday April 15th. The morning clinic will be an “Ace Girls Bermuda” swim clinic for girls only. I will host a second clinic for girls and boys combined in the afternoon,” she said. fantastic world record! well done!